Designed to be used with Flexcut’s quick-connect ABS handles, the tools in these compact craft kits are made of high carbon steel with solid ash handles. They can be used by hand or with reciprocating power carvers. Both sets are contained in a portable tool roll that protects the blades when not in use. 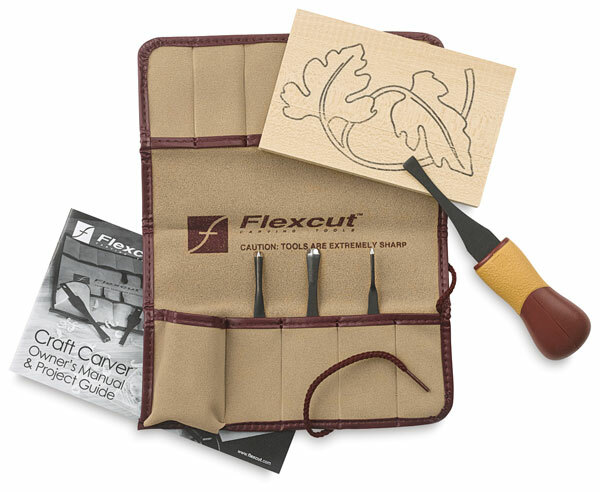 Craft Kit, Set of 5 — Flexcut’s entry-level, 5 piece deluxe tool set comes with 4 interchangeable blades, a quick-connect high-impact ABS plastic handle, a “Craft Carver” instruction manual, a carving blank, and a portable tool roll. Craft Kit, Set of 11 — Flexcut’s value-packed 11 piece set contains 10 interchangeable blades, a quick-connect high-impact ABS plastic handle, instruction manual, carving blank, and a portable tool roll.